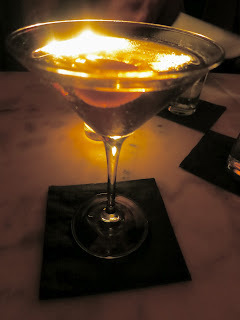 In November of 2008, I had heard that a great new lounge had opened on 14th Street -- a speakeasy-type lounge with incredible drinks. But, where was it? I walked this block every day and hadn't noticed any new places. I finally got ahold of the address and realized it was in the building next to Marvin with the unmarked door - clever. It reminded me of the secret raves from back in the day, but really it is supposed to be more like the secrecy that marked the Prohibition era and that contributed to the mystery of this lounge. Considering it is owned by Eric Hilton of the Thievery Corporation who also owns Marvin, it makes sense that it would be next door. Since its opening, The Gibson has expanded to two floors and three different areas at which you may enjoy their drinks. The first floor is for reservations only, that is, unless they have some open seats. If you are so lucky, you could snag a table on this floor just by walking in, but it isn't likely. I was able to do that once, but have never been able to do that again. The second floor is for walk-ins. During the summer, there is also an outside patio. I have had drinks on the first and second floors, but not the patio, where I hear they have a separate menu. My experience on the second floor hasn't been that great. In the past, when I've sat there, I haven't had great service. It is a much less formal atmosphere with chairs and coffee tables spread out across many different rooms. On this particular occasion, Zach and I were meeting two friends so we made reservations for a table on the first floor for 4 at 10 p.m. on a Friday night. When I arrived, I was carded by the usual guy who works the door who, I should mention, often wears a skinny tie. The first floor is my favorite of the two floors. It is always dimly lit and has great ambiance. If you are lucky enough to be seated in one of the booths, you can watch the bartenders show off as they shake their drinks. This time though we were seated at a table in the room towards the back of the lounge where the bar was out of sight. This floor seats 48 total at the bar, tables, and booths. They do not allow standing so it never feels crowded. Our reservation only held the table for 2 hours so I was anxious for everyone to arrive. Within 10 minutes, everyone was seated and we placed our drink orders. The drinks are very strong and very unique. You either love them or you hate them and because of that, they are happy to take drinks back if you really don't like them. With that in mind, I decided to try something new -- the Doe Eyed Farce. This is a vodka drink using Bison Grass vodka with Dolin Rouge vermouth, Dolin Blanc vermouth, orange bitters and Goldschlager. I really liked this one. 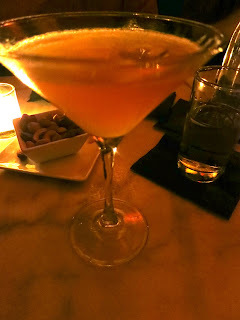 My friend, Fernando, ordered the Whisper, which had Rothman and Winter Apricot liqueur, Hayman's Old Tom, Lemon Juice, Bitter Truth Aromatic Bitters, and champagne. It was light and refreshing. 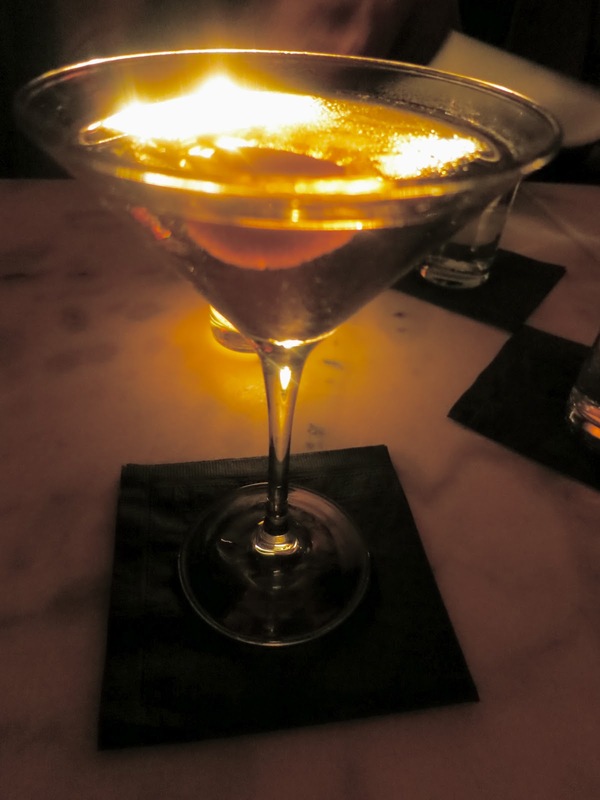 When I finished my first drink, I decided to order my old favorite, which is no longer on the menu -- the Relapse. They always make it for me when I ask even though it came off the menu a while ago. This is currently my favorite drink in DC because it is really spicy and well-balanced. It has ginger liquor and maple syrup as well as hellfire bitters, which give it its spice. My other friend ordered it and loved it as well. I should mention that some of these drinks are made the way they were back in the day -- with egg whites so be sure to let them know you prefer vegan drinks if you do. While we were enjoying our drinks, we asked about the dining menu. At one point, they were offering small plates of food, but for some reason they ceased that. Now they just offer some items to nibble on. I placed an order for the truffled nuts. They were okay, but I thought there was way too much truffle oil baked into these nuts, which took away from the flavor of the nuts themselves. At midnight, they brought us our check. It wasn't too bad. Even though the drinks are amazingly unique, they aren't overpriced at all as they range from $11 to about $16 each. All in all, it was a good night. The service at The Gibson is always good and the drinks are always something to look forward to. Considering that Derek Brown was hired to help open this lounge many years ago, it is no wonder that The Gibson and Derek's own bar, The Columbia Room at the Passenger, are my two favorite places for drinks in DC. Highly recommended. Just wanted to say that it's nice to connect with a fellow DC vegan! Lovely, thoughtful blog.